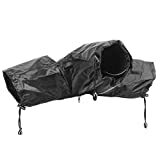 The Rain Cover protector is designed to protect your medium to large DSLR camera from any unexpected weather condition. It has a full length dual zipper that provides bottom closure when held it by hand or put it on a tripod. The adjustable Velcro straps help to fit your lens to your adjustment. Compatible with Canon Rebel T5i T4i T3i T3 T2i T1i XS XSi XT XTi SL1, EOS 1100D 1000D 700D 650D 600D 550D 500D 450D 400D 350D 60D 60Da 50D 40D 30D 20D 20Da 7D DSLR cameras and more. Its thickness is unique, which can meet all your requirements. – When suddenly caught by a rain shower, the Rain Cover slips quickly over your camera and allows you to keep on shooting. – The Cover (Black) is designed for Medium to Large SLR cameras. – It can be access to all camera and lens controls via two side sleeves and a clear view through the transparent TPU window that enables easy monitoring all the time. – It has a full length double zipper that provides bottom closure when held it by hand or put it on a tripod! – The interior adjustable Velcro straps help fit your lens to your adjustment. – The cover has drawstring arm protectors, room to adjust your arms for better shots. This entry was posted in Discount Photography and tagged Camera, Cameras, Canon, Cover, Digital, Mudder, Nikon, Protector, Rain, Rainproof by Ball Photo. Bookmark the permalink.